Toaster Oven Pizza Bagels are the ultimate appetizer, snack, or dinner. These quick and easy mini pizzas take just 15 minutes and have a crispy-chewy bagel crust that’s covered with plenty of melty cheese. 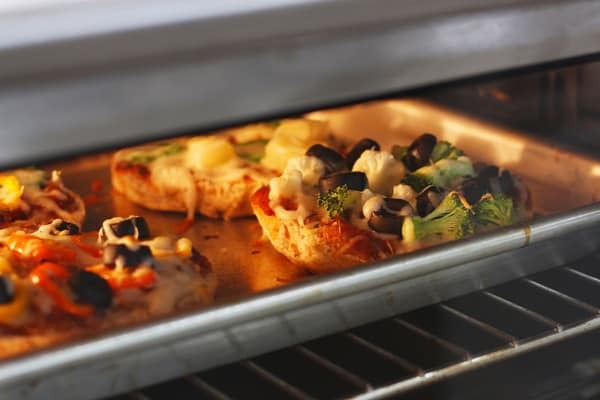 Add your favorite toppings and fire up the toaster oven tonight! This isn’t so much a recipe as a method for making pizza bagels in your toaster oven. Because really there are just three basic ingredients for a pizza bagel: Bagel – Sauce – Cheese and done! The bagel part is super simple – you need two bagels, any kind will do. I used sprouted wheat bagels from Trader Joe’s to make the ones pictured but pretzel bagels and everything bagels make seriously good pizza bases too. Every time we make or buy pizza sauce it’s always gone bad before we can use it all up. If you have the same problem, try marinara sauce we always seems to have an open jar in our fridge. To spruce up the sauce sprinkle on a little Italian seasoning and red pepper flakes. Or you could stir in tomato paste, minced garlic, fresh herbs or even hot sauce. Pesto is another great sauce option. Then it’s just shredded cheese and your favorite toppings. Snack-sized mini sweet peppers make perfect little pepper rings and pizza with black olives is soooo good! Just like with toaster oven veggie nachos and baked egg tostadas this is a great time to clean out the fridge. Pre-toasting the bagels before topping resulted in more of a thin crust style texture = lots of crunch with very little chew. To keep the insides chewy add your sauce, cheese, toppings and bake until melty and warm. Then turn your toaster oven to broil and let the magic happen. 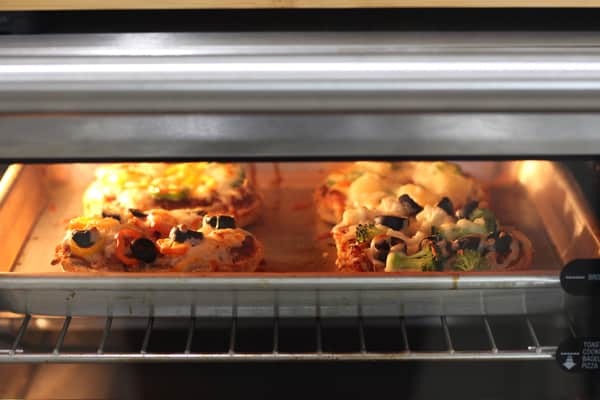 The broiler function on your toaster oven is what puts the P-I-Z-Z-A in a pizza bagel. It perfectly toasts the outside of the bagel giving you a crispy bagel crust with a chewy bready middle. And best of all it turns the cheese from just melted into golden and bubbly! Want to balance out all that cheesy goodness? Serve it with a large green salad. Make your salad twice as big as the pizza bagels and you can turn this quick and easy treat into a super satisfying meal. Preheat your toaster oven to 375 F and lightly oil your cookie sheet. Slice the bagels in half and place on the cookie sheet with the insides facing up. Spread each half with 1 tablespoon of sauce and sprinkle with Italian seasoning and red pepper flakes if using. Cover each bagel with 2 tablespoons of cheese. 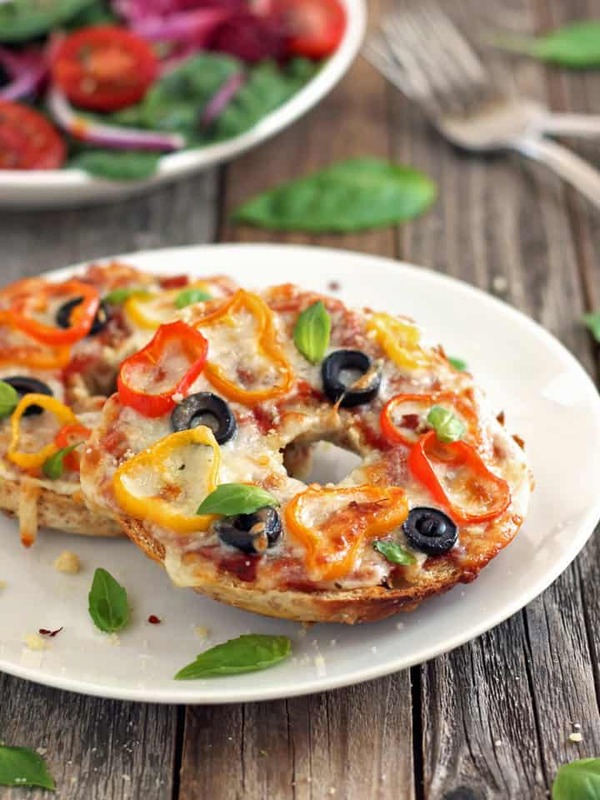 Distribute the peppers and olives evenly among the bagels and top each one with 1 tablespoon of the remaining cheese. Bake pizza bagels for 8 to 9 minutes until the cheese is melted. Turn your toaster oven to broil and cook for another 1 to 3 minutes until the bagel edges are crispy and the cheese is bubbly and browned. Let bagels cool for a few minutes before serving with fresh basil and Parmesan cheese. Nutritional information is an estimate for one serving of two pizza bagels made with one sprouted wheat bagel and all the fixin's. oooh, so colorful! a less beautiful rendition of this used to be one of my favorite elementary school lunches…it’s high time i revisit it as an adult! Haha Grace at my high school they just slapped some sauce and a slice of cheese on the top of a whole plain bagel and called it a day. The basil really helps to “adult up” the flavor. After many years of plant murder I just bought a basil plant – fingers crossed I can keep it alive 🙂 I know you’ve got a green thumb — any tips? Simple and delicious: two of my favorite words! 🙂 I love love love these and I know my kiddos will too! Thanks for sharing!